It’s almost December and while the rest of the internet is overflowing with cookies and fudge and sweets galore, here I am posting a healthy lunch recipe. Maaaybe this recipe should be shelved until January when everyone’s New Years resolutions kick in. Well regardless, I made these healthy Thai Chicken Lunch Bowls and now I’m sharing them with you. 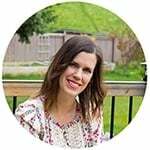 As you may or may not have noticed, over the past year I have had a blog revelation. Working full-time out of the house presents many challenges. I have had my share of 5-pm ‘what’s for dinner’ freak-outs. I have skipped breakfast on occasion, and I have bought a less than healthy lunch more often than I care to admit. All this time making super fun but super NOT practical food like these Loaded Popcorn Brownies and these Mojito Sorbet Floats. At some point I realized that I needed to start cooking the type of food that helped my family rather than the crazy over-the-top stuff that Pinterest goes crazy for. So we have had a lot of easy dinner recipes, some make-ahead breakfast recipes, and now I’m trying to tackle the problem of work lunches. I hope you are all on board with this evolution! If your morning is anything like mine, it is a rush to get out the door, and you need something you can just grab. A few months ago I made these Cauliflower Cashew Lunch Bowls, and I thought it was time to revisit this concept with these Thai Chicken Lunch Bowls! This time, I used brown basmati rice, and added some salt and chicken stock to add a touch of flavor to the rice. Next, I roasted up some veggies and chicken. I used carrots and broccoli for this, but you could use any variety of veggies that you have on hand. Just make sure they are the type that won’t go soggy after roasting. Finally, I made the peanut sauce. Peanut butter, lime juice and a few extra simple ingredients that you shake together. Easy peasy. Assemble your Thai chicken lunch bowls and you are good to go! An easy, healthy and tasty recipe that will keep for 3-4 days. And these lunch bowls will leave you feeling so much more energized than a lunch you bought at work and probably paid waaay too much for! Have yourselves a wonderful Monday! make these meal prep Cauliflower Cashew Lunch Bowls and you’ll have a delicious week ahead of you! 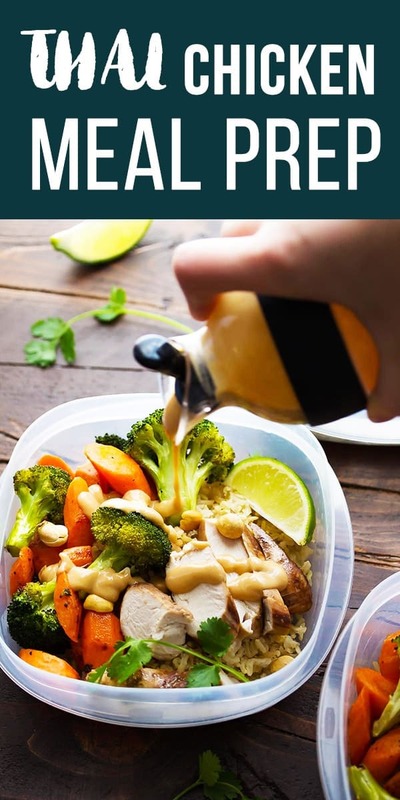 Thai chicken lunch bowls have roasted vegetables and chicken served over rice with a tangy peanut sauce. Cook rice in the chicken stock, water, salt and lime zest. I used my rice cooker to do this. Place the chicken in a small baking pan and cover with olive oil and soy sauce. Turn to coat. Bake for 10 minutes, flip the chicken and bake for another 10-15 minutes until the chicken is completely cooked through. Set aside and allow to rest for at least 10 minutes before slicing. Toss the vegetables in the olive oil and arrange on a large baking sheet. Bake with the chicken for 20 or so minutes, stirring once half-way through. Heat the peanut butter in a microwave-safe dish gently in 2-3 10 second increments. Stir until smooth. Stir in the remaining sauce ingredients. Add additional water as needed. Reheat in the microwave and then sprinkle with peanuts just before serving. These bowls will keep in the fridge for 3-4 days. Hi Mark, sorry for the confusion! I can see how the recipe is worded a little weird. Total cook time for the chicken is 25 minutes. Total cook time for the vegetables is 20 minutes. Hope this helps and I hope you enjoy the recipe! Would love to try some of these but since I only cook for myself my choice is to either eat the sale thing every day for a week or to freeze some portions! Why is it called *ginger* peanut sauce? Is there supposed to be ginger in it? No worries. I actually ended up adding ginger anyway. I also added garlic, soy sauce and sriracha because I found the sauce tasted just like a somewhat tangy peanut butter. That is just my taste though. I wanted a more traditional Thai peanut sauce. The recipe ended up really good though! I love the idea of roasting chicken and vegetables for healthy lunches. Thank you! Outstanding! Thoroughly enjoyed the flavors. This was delicious! Swapped the carrots for red bell pepper and loved every bite. So happy you enjoyed it, Maria 🙂 Thanks for reporting back! Made these for lunch this week, super delicious! Made a couple tweaks, use honey instead of Brown sugar and turned out delicious! Used whatever veggies I had on hand or what was on sale. Will definitely make again in the future, thanks for the recipe! So glad to hear you enjoyed it, Rosie! This was fantastic!! I substituted Sunbutter in the dressing and left out the brown sugar and used a few drops of DoTerra Lime oil since I didn’t have lime juice on hand. It was super scrumptious and I had multiple coworkers remark how good my lunch smelled/looked today! ? Thanks for a great recipe Denise! I made this on Saturday for my weekly meal prep. Let me just say that it was soooo easy to make- and so delicious. I love Thai flavors, but never really make anything outside of curries at home. This recipe is definitely a keeper. This is a great start but the dressing needs help. I added soy sauce, garlic, ginger, sriracha, and vegetable oil for a much more flavorful dressing. Loved the dressing! Simple and yummy. Wow great recipe. I love your blog and recipe. Nice posts here. Keep it up. This is such a great and inspiring idea and obviously the perfect lunch recipe. Thanks, I know I’ll be trying it! Keep posting like this way. Thanks so much, Dustin! Hope you enjoy! Hey Sharna! The dressing might not be as flavorful without the sugar but it should still be pretty tasty. I loved this recipe so much! I’ve used it as inspiration for some chicken burgers served up with the peanut and lime sauce! Can these meals be frozen? Eat later! Hi Karen, I’ve never tried freezing them, as I don’t really care for freeze/thawed rice. Let me know how it is if you give it a try! Dumb question. The recipe says “Bake with the chicken for 20 or so minutes, stirring once half-way through.” Does this mean I put the chicken back in with the veggies or cook the chicken and veggies all together? Sorry for the confusion, Sandy! It just means you bake them in the same oven. I keep them on a separate baking sheet so I can keep an eye on them and pull them out if they are ready before the chicken. Does that make sense? This lunch bowl looks amazing! I love peanut sauce and am going to add this to my Yum page. I say bring on the healthy recipes! I totally need them right now to balance out the sweets! These bowls look fantastic! Yay! I haven’t broken out the holiday baking much yet, but I hope to fit some in soon. Thanks, Ashley! Haha, does a healthy lunch really make all those Christmas cookies disappear?! I am SO on board! I’m loving all of the real food recipes! Rice bowls with chicken and veggies are such great healthy comfort food!! These definitely sound like perfect winter lunches. I’m filing this away for when I need to start packing hubby’s lunch again! I couldn’t agree more – just because it’s December doesn’t mean we don’t need healthy everyday food! Just last night we had brown rice and a green veggie stir-fry. That peanut lime sauce in your lunch bowl absolutely trumps my sauce-game though! Will need to try it ASAP! I’m glad you’re on the same page as me, Nora 🙂 I’m sure your stir fry was amazing, lady! I’m all about healthy lunches, especially to cancel out all of the calories from the cookies I’ve been eating 😉 These bowls look so delicious, Denise! I’m loving that peanut lime sauce too! I love all your recipes, your new direction and your outrageous ones! And your photos totally inspire me, I can spot yours right away you have certainly found your “style” 🙂 Just beautiful! You are too sweet, Annie! And thank-you SO much for the photography compliment! It’s been very challenging with the winter light lately. Thanks so much, Jessica! I’m so glad you liked the cauliflower cashew bowls! Denise! This is what I want for lunch today!!! oh my gawd, these Peanut-Lime Chicken Lunch Bowls look so good! Delish! Denise, this is what I want for lunch today!!!! oh my gawd, these Peanut-Lime Chicken Lunch Bowls look so good! I love your healthy lunch ideas, and I can’t wait to try this one! Sounds delicious! Thank-you so much, Lisa! I hope you like it! I’m definitely in need of some healthy meals to balance out all of the calories I’ve consumed over the weekend. These bowls look like just the thing to get me back on track! Love the peanut lime flavor! Ha ha ME TOO! I ate almost a whole batch of puff pastry pinwheels. I don’t want to know how many calories that was 🙁 THanks, Gayle! I’m on board!! Lunch is one of the hardest things for me to plan. Usually I’ll go for dinner leftovers, but between the two of us those go quickly. That, plus I get so bored with my go-to sandwiches. These lunch bowls would definitely amp up lunch! Yay! I am working from home right now and I still struggle with lunch. I just want something I can pop in the microwave. Thanks, Alyssa! I’m totally on board with practical meals for the family. I love that you’re sharing a lunch option. I find myself thinking about what my guys can eat for lunch that is healthy. This sounds great! That peanut lime flavor is amazing! I’m having trouble getting on the Christmas-baking train — I just want real food! These lunch bowls look so healthy and delicious — and that peanut lime sauce! Yum. I am like you, Denise, I NEED healthy recipes right now! Like give me LOADS of healthy recipes to combat all the calories I have been (and will be continuing to) consuming. If I wait until the new year to eat healthy at lunch I won’t be able to fit through doorways! lol. LOVE these bowls, chicka! That peanut and lime sauce sounds delish! This makes eating healthy look fun! Cheers, my dear!